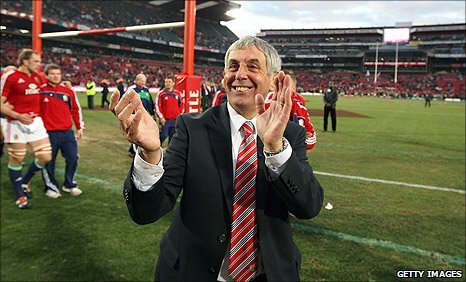 Sir Ian McGeechan could once again take charge of the British and Irish Lions when they tour Australia in 2013. McGeechan, who has been on seven Lions tours as a player or a coach, had said the thrilling 2-1 series defeat by South Africa in 2009 would be his last. But 2013 Lions tour manager Andy Irvine said McGeechan "has to be a consideration" to take the job again. 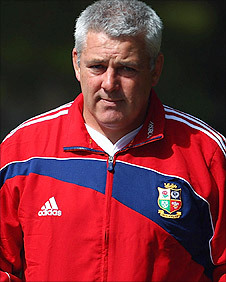 Irvine added that it is unlikely a home nations coach will be appointed to lead the Lions in 2013. The former Scotland and Lions full-back was appointed as tour manager on Monday and one of his main roles is to select a head coach for the tour. He says he is keen for the issue to be settled relatively early, with an appointment possibly being made after the 2011 World Cup in New Zealand. Wales boss Warren Gatland, Scotland's Andy Robinson, Ireland's Declan Kidney and Martin Johnson of England are all possibilities but the Lions management team have concerns about appointing a coach who will be involved in the Six Nations tournament earlier in the year. However, Irvine said the Lions will speak to the Welsh Rugby Union about the possibility of agreeing a break clause with regard to Gatland. "It's not feasible for a head coach to run the national side in the Six Nations prior to the tour because it would be asking too much," said Irvine. "The national sides would probably baulk at that idea anyway because their national coach's eye would be taken off the ball. "We'll be speaking to the WRU to see what level of commitment Warren must give to them as opposed to the Lions. "It's theoretically possible to coach the Lions and be the head coach of a national side in the Six Nations immediately prior, but it's unlikely. "If we weren't looking for a complete release of Warren by the WRU, then we'd certainly want a partial release." McGeechan would also be high on the list of possible candidates following his long and extraordinary career with the Lions. He played in two tours, winning in South Africa in 1974 and losing in New Zealand three years later. The former Scotland, Northampton and Wasps coach, who is now performance director at Bath, went on to lead the Lions on three occasions. McGeechan memorably lead the touring side to series victories over Australia in 1989 and South Africa in 1997, while they lost 2-1 against New Zealand in 1993. His side just came up short in South Africa in 2009, a last-minute penalty sealing a series victory for the Springboks in the second Test. In 2005, he was part of Clive Woodward's coaching staff on the controversial tour to New Zealand that saw the All Blacks comprehensively win the series 3-0. However, McGeechan's midweek team were unbeaten on the tour. Irvine added: "McGeechan said after South Africa that he wouldn't be interested in coaching, but he said that after three other tours as well! "Geech is back in the fold at Bath. He doesn't quite have a tracksuit on every day but he's still very much in touch with the game. "We've very much got an open mind on Geech - his record speaks for itself, he's Lions through to the core and did a fantastic job on the last tour. "He has to be a consideration. If he rules himself out I wouldn't want to put any pressure on him. "Whoever coaches the Lions has to want to do it, but if Ian throws his hat into the ring we'd seriously have to look at it. "The last tour got an awful lot of things right and that should be the template for the way forward." For his part, McGeechan hinted that his determination to end his Lions association is already wavering. "Your enthusiasm for the Lions doesn't change," he told the Daily Telegraph . "I've yet to speak to Andy about any of this. I need to have those sort of conversations. "I know what I said at the time but here we are, talking about it, and it all starts to look exciting again." Irvine also warned that a lot can change between now and when the announcement is made. "Last time Eddie O'Sullivan was a front runner at this point in the cycle but Ireland had such a disappointing World Cup and Six Nations that he lost his job with Ireland," he said. The Lions are set to play nine games on the 2013 tour, with the first match taking place in Hong Kong against the Barbarians, and are expected to take on at least four of the five Australian Super 15 sides. Irvine also raised the possibility of Argentina joining New Zealand, South Africa and Australia on the Lions tour schedule, with 2021 the first possible window to tour the country.